Check out the Plain Grilled Sirloin Steak calories and how many carbs in Plain Grilled Sirloin Steak. Learn all the nutrition facts about what you eat at GymAmerica. Description: Top sirloin beef steak seasoned and grilled. Tip: Click on the ingredient links to learn the nutritional information for all the Plain Grilled Sirloin Steak ingredients. The serving size for any ingredient in Plain Grilled Sirloin Steak may be adjusted using the nutrition facts serving size calculator. Use it to help cut calories, carbs and more from your recipes. Clean and trim steak. Salt and pepper to taste. Grill steak on hot grill for 6 minutes per side, for medium-rare 12 minutes for medium or 14 minutes for well-done. 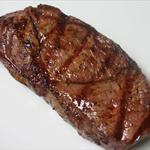 Are you interested in seeing additional foods like Plain Grilled Sirloin Steak? Then click here. GymAmerica has detailed nutrition facts information for over 40,000 foods and recipes.